Looking for a new favorite comfort food? Look no further than my Roasted Red Pepper Puttanesca Lasagna Rolls. 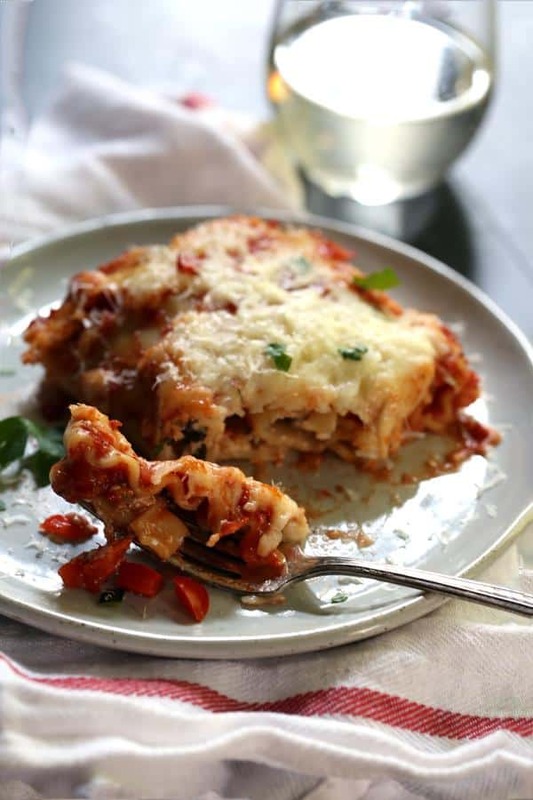 Single serving lasagna rolls are filled with vegetables, olives, capers and cheese before being bathed in a roasted red pepper sauce and blanketed by two additional layers of cheese and emerge from the oven a pan of melty, bubbly goodness. Oh, the stories I could tell you about the afternoon I spent making these delicious Roasted Red Pepper Puttanesca Lasagna Rolls. It was a Sunday afternoon and the menagerie was either napping or having resting time and Andy was rounding at the hospital. The perfect time for me to make a recipe to photograph, right? You know how this story is going to go, right? First, I discovered that I had already packed the pot I wanted to boil the lasagna noodles in – oops! And then, thunderstorms hampered me taking these photos not once, but twice! By the time I was done, I wanted to do nothing but drown my sorrows with a plate of these comforting lasagna rolls. The cheese! Oh, the cheese. Definitely the cure to whatever ails you, don’t you think? We’ve got mozzarella. We’ve got ricotta. And of course, there’s lots of Parmesan for good measure. All cheese bases are indeed covered! 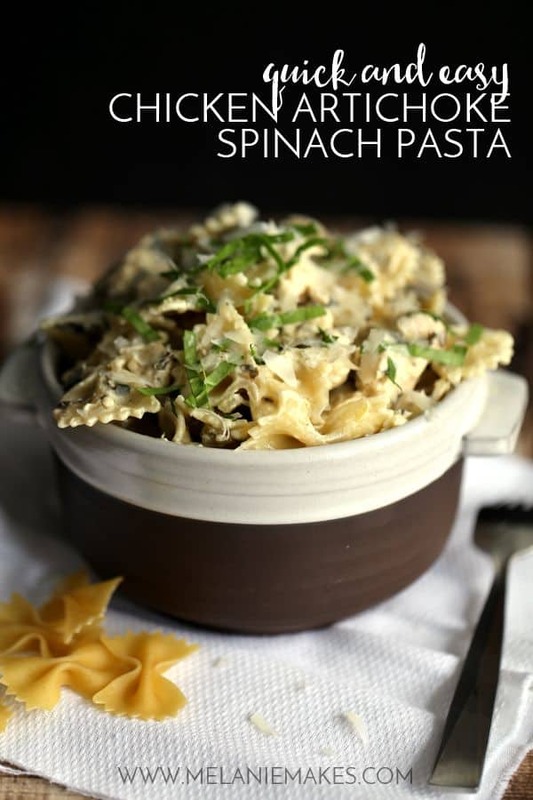 And hidden between all those layers of noodle and cheese? Veggies! Lots and lots of vegetables. Red peppers, onions and zucchini. Basically the veggies that have been arriving in my weekly vegetable box as of late. And for my own little twist, I added capers and kalamata olives for a bit of a pasta puttanesca spin on things. The contrast of the sweetness from the sauce with the saltiness from the olives and capers are spot on. And how can I forget the sauce? The easiest and most flavorful two ingredient sauce ever created. Yes, you read that right. TWO ingredient sauce. I simply stirred together a can of crushed tomatoes with a bottle of Robert Rothschild Farm’s Roasted Red Pepper and Onion Sauce and added a bit of salt and pepper. 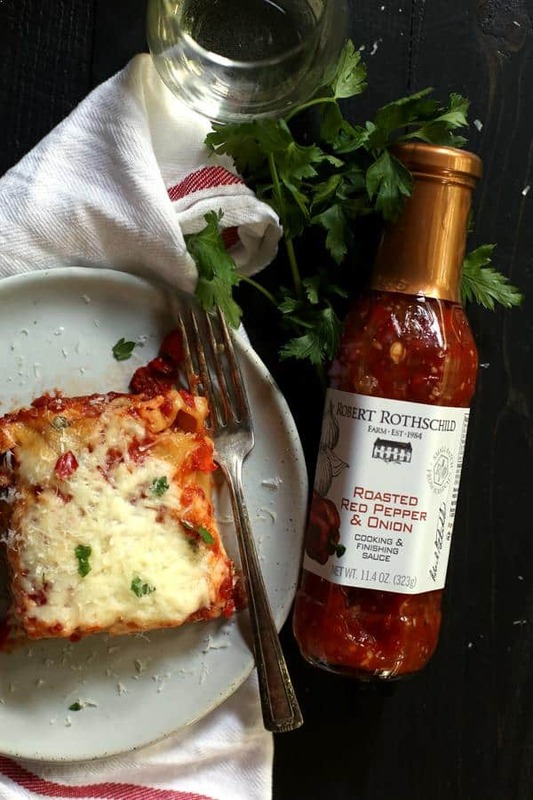 I love when someone else has done the hard work for me and Robert Rothschild Farm did just that with this sauce. A savory combination of red wine and garlic adds to the versatility of this tomato based sauce that truly puts the spotlight on the roasted red peppers. Put the jar of marinara away, my friend. 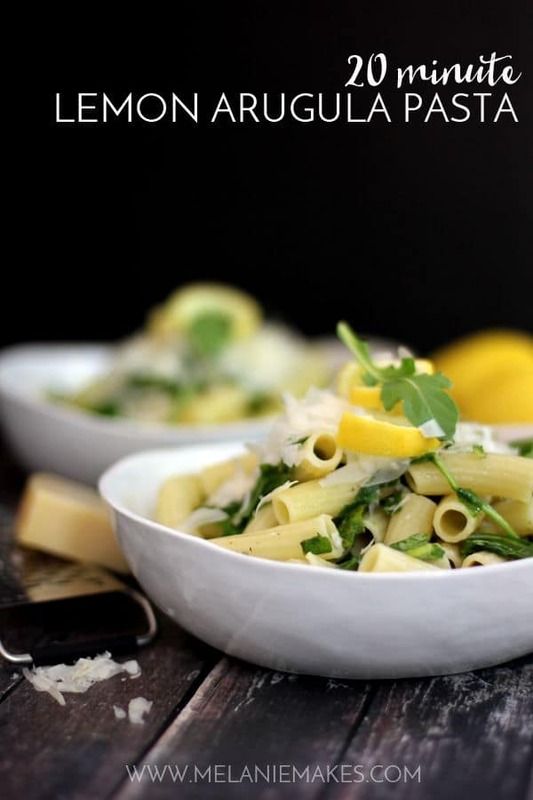 This is the perfect spring and summer pasta dish thanks to this flavor packed sauce. In a large saucepan, add oil and heat over medium heat. Add pepper and onion and saute for two minutes or until beginning to soften. Add succhini and garlic and cook an additional two minutes. Remove pepper mixture to medium bowl and refrigerate for 10 minutes to cool. Add olives, capers, cheeses and egg to bowl and stir until combined. Set aside. In a medium bowl, stir together tomatoes, Robert Rothschild Farm Roasted Red Pepper and Onion Sauce, salt and pepper. Grease a 9x13 pan and add 1 cup of sauce to pan to cover the bottom. 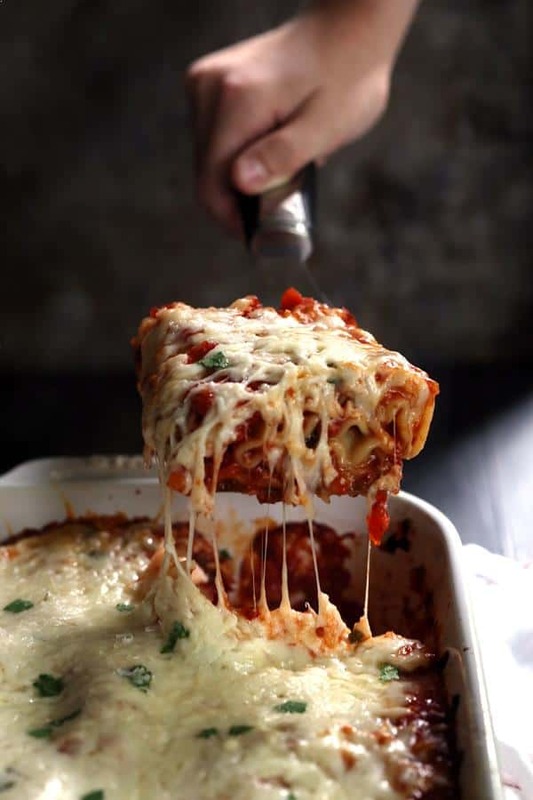 On sheet pans or clean counter top, arrange cooked lasagna noodles to form an assembly line. Put roll filling in large sized plastic storage bag and snip a hole in one corner to make a pastry bag. Insure that hole is large enough to allow diced vegetables to exit bag easily. Pipe filling mixture down the center of each lasagna noodle. Roll noodles from one end to another over filling and place in three rows of four in pan. Cover rolls with remaining sauce and then sprinkle with both cheeses. Bake for 30-40 minutes or until sauce is bubbling. Allow to sit 10 minutes before serving. 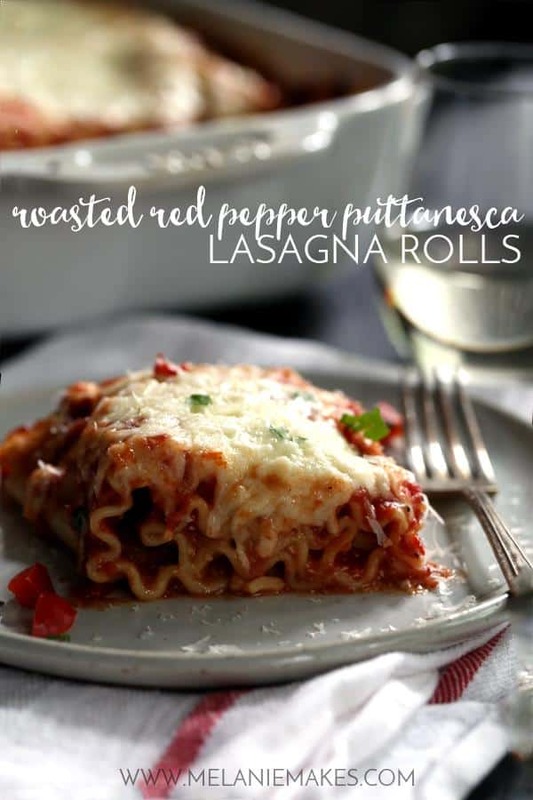 These Roasted Red Pepper Puttanesca Lasagna Rolls would be perfect for your next family dinner or if you aren’t feeding a crowd, simply freeze individual rolls to have a quick and easy meal at the ready! Win/win, cheesy win! Oh boy I feel ya on the troubles with timing of shoots! It always happens, the moment I get everything set up, the babe wakes up! And I like your style...lets just drown our sorrows in cheese! 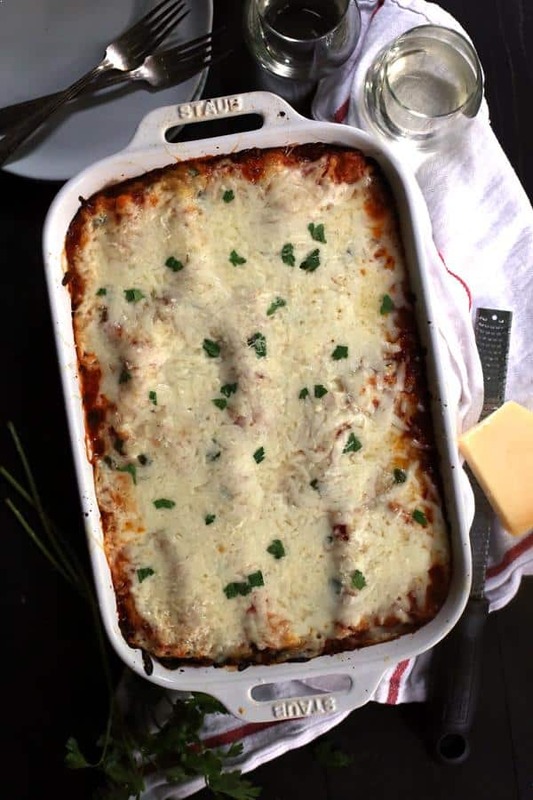 I love homemade lasagna and that sauce looks so good! Wow Melanie, this looks incredible. I love the addition of peppers! this looks amazing!! and all that cheese? yum! 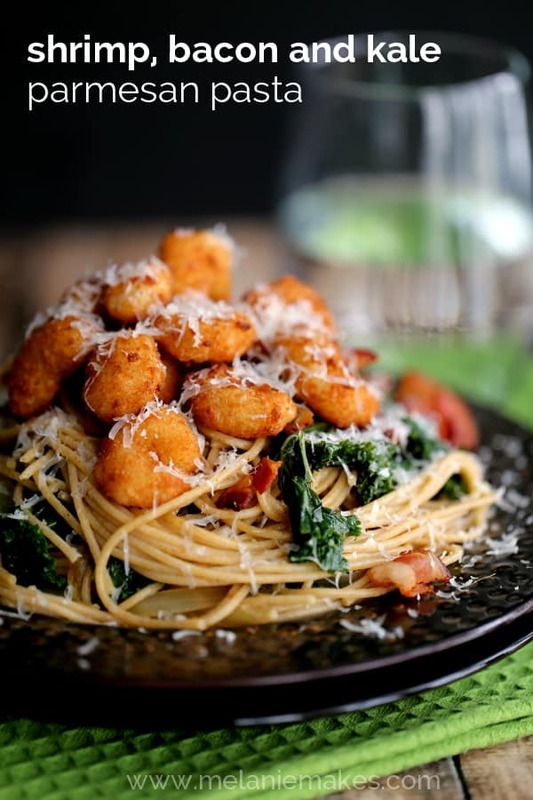 My family would love to have this for dinner- yum!